iTunes is the default program for accessing and transferring music, photos and other files for Apple devices. Similarly to other Apple devices, iPod relies on iTunes for its file transferring and backup as the default. Many of us have grown accustomed to syncing and accessing files on our iPod through iTunes over the years since iPod first entered the market many years ago. However, Apple doesn't allow us to transfer non-purchased music from iPod to iTunes library due to Apple's concerns of copyright infringement issue and their ability to generate profit from music and songs purchased from iTunes. So if we stuff our iPods with songs we like and more importantly, for free, we will face with the problem of how to get non purchased songs from iPod to iTunes. Many people, like me, have asked the following question - How to get non-purchased songs from iPod to iTunes? Well, there are two solutions for the music transfer. With our dr.fone - Transfer (iOS) iPod Transfer, you can now easily transfer non-purchased music from your iPod to iTunes. dr.fone - Transfer (iOS) iPod Transfer is a perfect solution for the users who want to transfer non-purchased music from iPod to iTunes, and it enables users to finish the task in seconds. You can transfer music from iPod Shuffle, iPod Nano, iPod Classic and iPod Touch to iTunes fast. Step 1 To transfer music from iPod to iTunes, simply download and install dr.fone - Transfer (iOS) iPod Transfer tool. Then connect Your iPod to Computer to transfer music. This iPod Transfer tool will automatically detect your iPod. Step 2 Click "Transfer Device Media to iTunes" icon on the main interface. Then click "Start" on the next page to transfer music from iPod to iTunes. All the files of the device will be scanned and will be visible under different categories like Music, Movies, Podcasts and others. By default, all types of files will be checked. In order to only transfer the music files, uncheck the other items and then click “Start”. Files will be successfully transferred to iTunes. Click the “Music” tab, and then check square beside the songs to select the non-purchased songs you want to transfer, or you can transfer the whole music library from iPod to iTunes by checking the square beside Name. Then you can right-click the selected files and choose “Export to > Export to iTunes”. Transfer your Music from your iOS Device You can now transfer your music from your iPhone, iPad or iPod back into your iTunes. 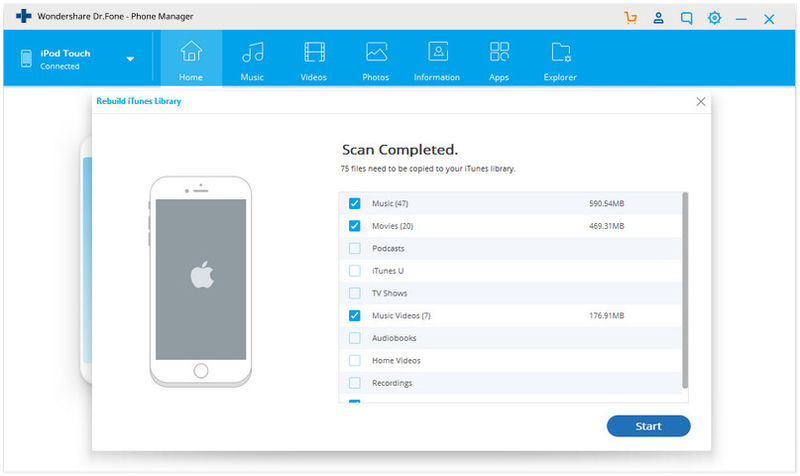 Whether you lost your computer data or were given a device with preloaded music, dr.fone - Transfer (iOS) can move your music from your iOS device back into your iTunes library on your computer. Clean your Entire Music Library dr.fone - Transfer (iOS) automatically analyzes and cleans up your music library with one click. You can also manually tag your music, change album cover art, delete duplicates, or remove missing tracks. Your music collection is now beautifully organized. 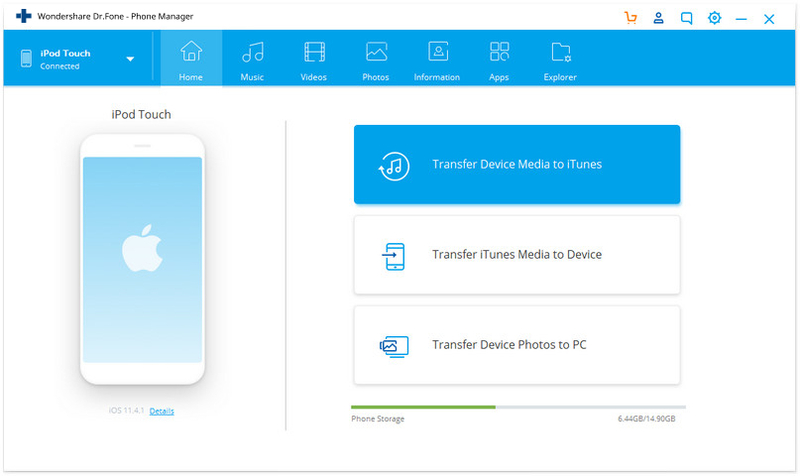 Manage iOS Devices without iTunes Manage, discover and share your music with dr.fone - Transfer (iOS). No more sync of iTunes. dr.fone - Transfer (iOS) frees your music, doing what iTunes can't. Use iTunes with Android iTunes and Android – together at last! dr.fone - Transfer (iOS) breaks down the barriers of iTunes and lets Androiders use iTunes just like an iOS device. Sync and transfer your iTunes library to your Android device easily with dr.fone - Transfer (iOS). 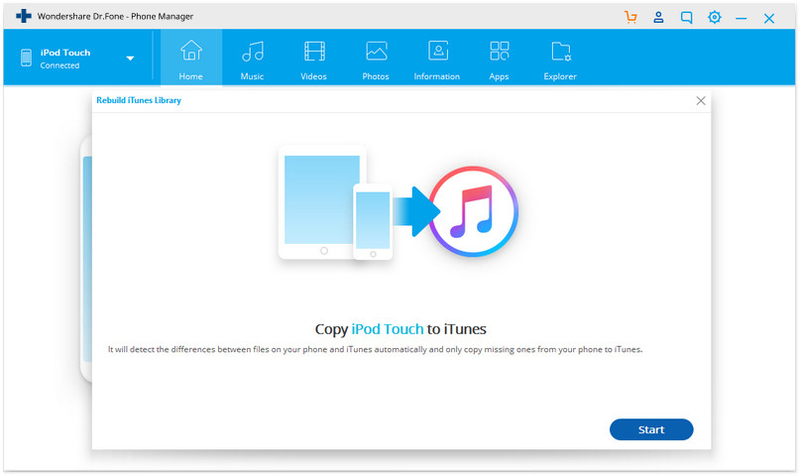 This is one of the methods that can help you to transfer non-purchased music from iPod to iTunes, and you only need your iPod, an iPod USB cable, and your computer to finish the task, but this method is a little complicated which is suitable to the technical guys. Connect your iPod to computer with the USB cable. Your iPod should be able to show under ‘My Computer’ window as is shown below. 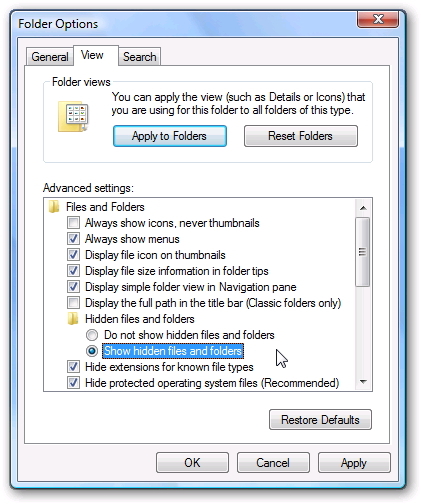 Click Tools in the menu bar of Windows explorer, and select Folder Option > View, then check "Show hidden hidden files and folders". Double-click the iPod icon in My Computer to open it. Find the "iPod_Control" folder and open it. 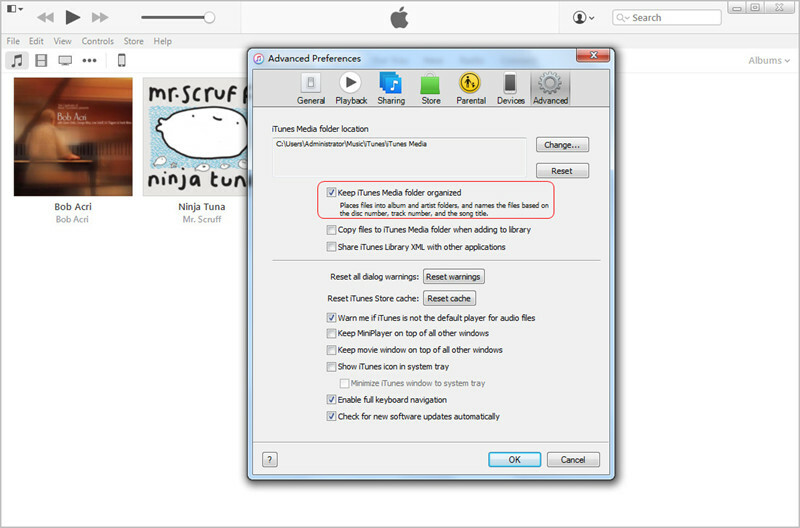 Find Music folder after opening the iPod_Control folder. Then copy the whole folder to computer. 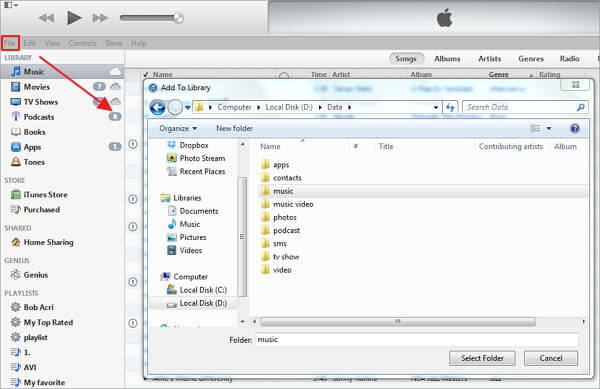 Start iTunes and click File > Add Folder to Library to add the music folder to your iTunes Music Library. After adding the music files to iTunes library, click Edit > Preferences > Advanced, and check "Keep iTunes Media Folder Organized". It does not require additional software packages or applications. It is easy to follow when you have a basic understanding of IT. iTunes displays music randomly in the library if you use this method. 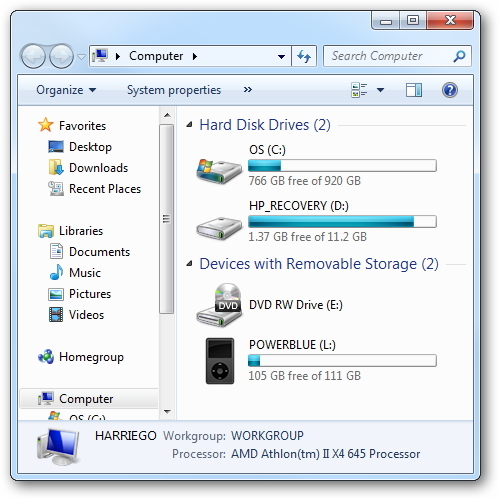 The process of showing your hidden files may leave your important system folder exposed. The process is complicated for someone who has no basic understanding of IT. 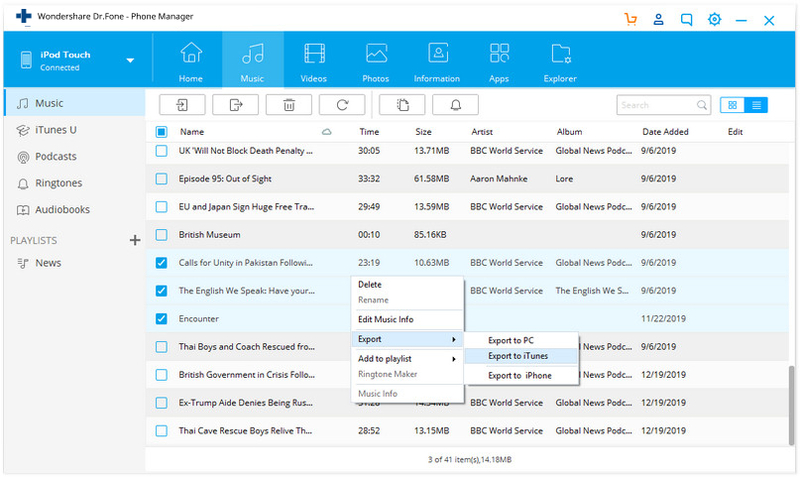 Top 2 ways to transfer music from iPod to computer,using manual way or use Wondershare TunesGo to finish the task in a few seconds. Are you looking for ways to put music on iPod shuffle without losing the previous songs? It’s easy. This article provides top 4 ways step by step. To extract music from an iPod, basically, there are 2 simple ways. This article would talk about how to extract music from an iPod to iTunes and PC. Whether you need to transfer music from computer to iPod with iTunes or without iTunes, here we introduce best 2 ways to transfer music from computer to ipod touch. Learn how to transfer music from iPod to iPhone in this stepwise tutorial. It is an informative guide to transfer iPod music to iPhone and vice-versa.